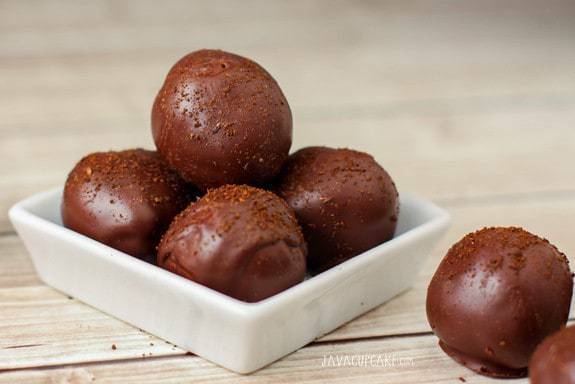 Espresso Truffles made from richly flavored espresso ganache covered in dark chocolate and crushed espresso flakes make for an indulgent dessert! I decided to make truffles. 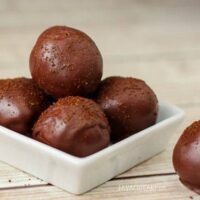 Making these truffles was really quite simple. I simple rolled chilled ganache into balls, covered them in melted chocolate and then topped them with ground espresso beans. The process couldn’t have been quicker or easier. And the result… decadence with every bite. If you’ve never seen an espresso grinder before… well, you’re not the only one. I found the grinder in a Lindt store in Berlin. There were two kinds actually, one espresso and one sugar and chocolate. Of course, I brought home both. You may have seen them in the Berlin giveaway I just hosted with Erin of Texanerin Baking. There are dozens of ways you could use this espresso grinder, I mean the possibilities are endless. 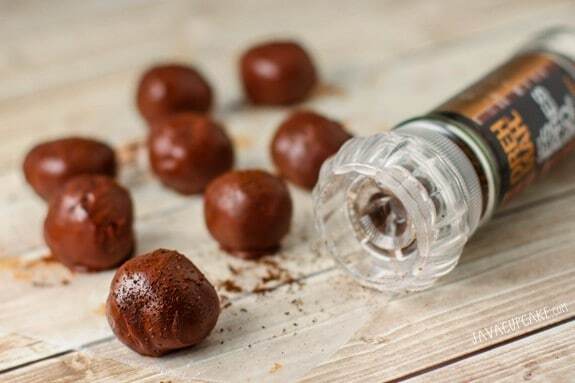 Just like taking a look at sites such as Neptune Coffee if you are considering purchasing a coffee grinder to make fresh coffee everyday, the use of this mini espresso grinder does a similar sort of job, but is used for more a garnish. On top of cookies before baking, garnishing cupcakes and cakes, in your coffee for a little extra kick. I guess you might be able to use this in your coffee too, if you want to make it a little stronger, use this grinder! Everyone needs one in their kitchen. 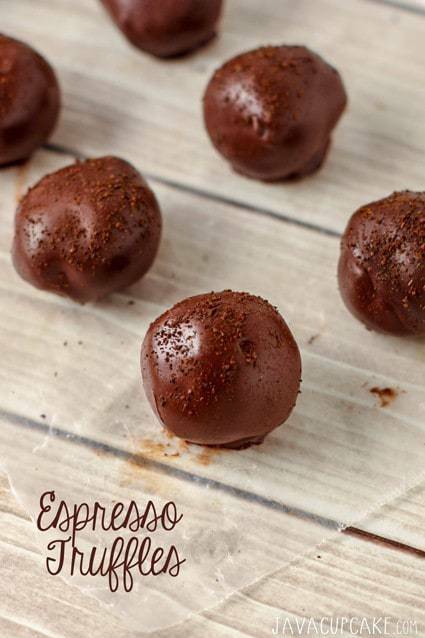 One bite of these melt-in-your-mouth espresso truffles will leave you wanting more… and more…. and more. They have a dark chocolate taste, a creamy texture, and a rich coffee flavor that is so incredibly delicious and indulgent. Chop up the 120g chocolate and place in a glass bowl. In a small sauce pan, combine the espresso powder and cream with a whisk. Heat the cream and espresso together over high heat until it comes to a rolling simmer. Pour the hot milk over the chocolate and let stand for 1 minute. DO NOT STIR! Add the vanilla extract and butter and stir with a rubber spatula SLOWLY until all the chocolate has melted. NOTE: Make sure to scrape the bottom and sides of the bowl several times to ensure everything has been incorporated. Pound the bowl on the counter 3-4 times to remove any air bubbles. Allow the chocolate to cool, uncovered, until it reaches room temperature and begins to solidify. This should take 3-4 hours. Line a flat baking sheet with wax paper. Once the chocolate is solid, roll 1in balls of chocolate in your hands and place on the wax paper. Freeze the balls for 2-3 hours or until completely firm and very cold. Melt 80g chocolate over a double boiler. One at a time, drop the cold balls into the melted chocolate. Move around with a fork to cover completely. Lift the chocolate with the fork and tap any excess. Place the covered chocolate on the wax paper and immediately grind the chocolate/espresso over the top of the truffle. NOTE: If you don't have a chocolate/espresso grinder, you can top the truffles with anything else you'd like. Chocolate jimmies, a coffee bean, sea salt. The melted chocolate will harden very quickly - if you're going to top the truffles with something, be quick about it! Allow the melted chocolate to set completely before serving the truffles. If not serving immediately, store in an air tight container in the refrigerator. Remove 30 minutes prior to serving. I totally need an espresso grinder, but more importantly I need these truffles! I love anything with coffee flavors but when they are paired with chocolate it makes it even better. Coffee and chocolate is one of the best combination. Love your truffles! These would make a great addition to my Christmas cookie boxes. 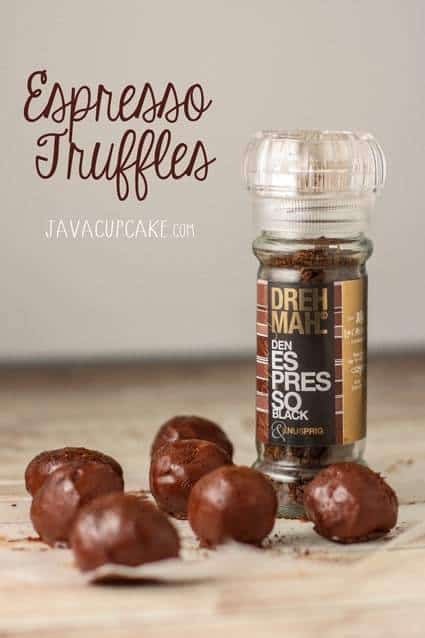 Is the espresso powder mentioned in the recipe, the instant kind? Your recipe is a keeper. I like it for its detailed instructions and does not take for granted that we know the minor steps. Do these freeze well? or will they separate? I have never frozen them, but I can’t imagine whey they’d separate. Thanks, I was just thinking that the chocolate might separate when it was frozen. I need to make a large quantity and I don’t have time to do an experimental batch in advance.